If your heart beats an average of 75 times a minute for 80 years, it will beat more than 3 billion times and pump more than 200 million liters of blood. Understandably, it requires an abundant supply of oxygen and nutrients. Even though the heart is only 0.5% of the body's weight, it uses 5% of the circulating blood to meet its own metabolic needs. 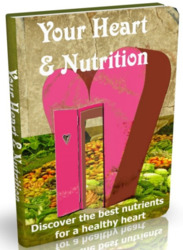 The cardiac muscle is not nourished to any great extent by the blood flowing through the heart chambers. Instead, it has its own supply of arteries and capillaries that deliver blood to every cell of the myocardium. The blood vessels of the heart wall constitute the coronary circulation. At rest, these vessels supply the myocardium with about 250 mL of blood per minute. 1. The anterior interventricular artery travels down the anterior interventricular sulcus toward the apex. It issues smaller branches to the interventricular septum and anterior walls of both ventricles. Clinically, this vessel is also called the left anterior descending (LAD) artery. 2. The circumflex artery continues around the left side of the heart in the coronary sulcus. It supplies blood to the left atrium and posterior wall of the left ventricle. 1. The marginal artery supplies the lateral aspect of the right atrium and ventricle. 2. The posterior interventricular artery travels down the corresponding sulcus and supplies the posterior walls of both ventricles. Which ventricle receives the greater coronary blood supply? Why should it receive a greater supply than the other? List the vessels that supply it. The energy demand of the cardiac muscle is so critical that an interruption of the blood supply to any part of the myocardium can cause necrosis within minutes. A fatty deposit or blood clot in a coronary artery can cause a myocardial infarction14 (MI), the sudden death of a patch of tissue deprived of its blood flow (see insight 19.2). The coronary circulation has a defense against such an occurrence—points called anastomoses (ah-NASS-tih-MO-seez) where two arteries come together and combine their blood flow to points farther downstream. Thus, if one artery becomes obstructed, some blood continues to reach myocardial tissue through the alternative route. The most important anastomosis is the point at which the circumflex artery and right coronary artery meet on the posterior side of the heart; they combine their blood flow into the posterior interventricular artery. Another is the meeting of the anterior and posterior interventricular arteries at the apex of the heart. interventricular artery. It carries blood from the apex of the heart toward the atrioventricular sulcus. • The middle cardiac vein, found in the posterior sulcus, collects blood from the posterior aspect of the heart. It, too, carries blood from the apex upward. • The coronary sinus collects blood from these and smaller cardiac veins. It passes across the posterior aspect of the heart in the coronary sulcus and empties blood into the right atrium. Figure 19.10 The Coronary Blood Vessels. (a) Anterior aspect; (b) posterior aspect. A myocardial infarction (MI)—what most people call a heart attack—is the sudden death of a patch of myocardium resulting from ischemia15 (iss-KEE-me-uh), the loss of blood flow. It occurs when a coronary artery becomes obstructed by a blood clot or a fatty deposit (atherosclerosis; see insight 19.5 at the end of this chapter). The myocardium downstream from the obstruction dies from hypoxia (oxygen deficiency). This tissue necrosis is felt as a sense of heavy pressure or squeezing pain in the chest, often radiating to the shoulder and arm. Infarctions weaken the heart wall and disrupt electrical conduction pathways, potentially leading to fibrillation and cardiac arrest (discussed later in this chapter). 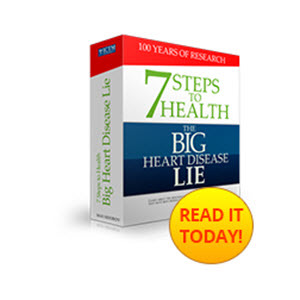 Myocardial infarction is responsible for about half of all deaths in the United States. A temporary and reversible myocardial ischemia produces a sense of heaviness or pain called angina pectoris16 (an-JY-na PEC-toe-riss). As the myocardium becomes hypoxic, it relies increasingly on anaerobic fermentation. This generates lactic acid, which stimulates pain receptors. Most organs receive more arterial blood flow when the ventricles contract than when they relax, but the opposite is true in the coronary arteries. There are two reasons for this. First, contraction of the myocardium compresses the arteries and obstructs blood flow. Second, when the ventricles relax, blood in the aorta surges back toward the heart and fills the semilunar valve cusps. Since the coronary arteries open at the bottom of the pockets created by the cusps, they are filled by this backflow. 1. Make a two-color sketch of the pericardium; use one color for the fibrous pericardium and another for the serous pericardium and show their relationship to the heart wall. 2. Trace the flow of blood through the heart, naming each chamber and valve in order. 3. Define pulmonary and systemic circuit. 4. Trace the flow of blood from the left coronary artery to the apex and then to the coronary sinus. 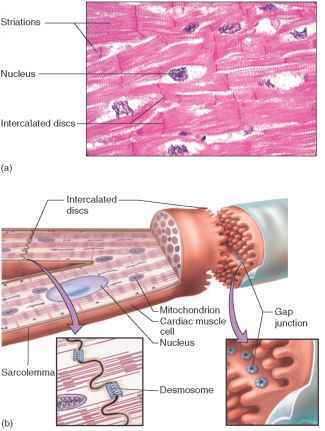 Figure 19.11 Cardiac Muscle. (a) Light micrograph, (b) cardiac myocytes and intercalated discs. Which ventricle receives greater coronary blood supply? Which ventricle receives more blood flow via coronary arteries and why? 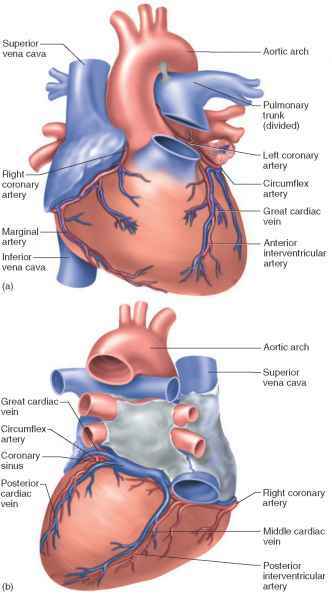 Where the coronary blood vessels lie in the heart? Which artery travels down the anterior surface of hte heart to the apex? What ventricles recieve a greater coronary blood supply? Which artery travels under the left auricle and then divides into two branches?